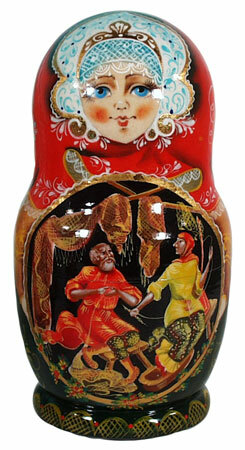 We are glad to present you the nesting doll Golden fish folktale. 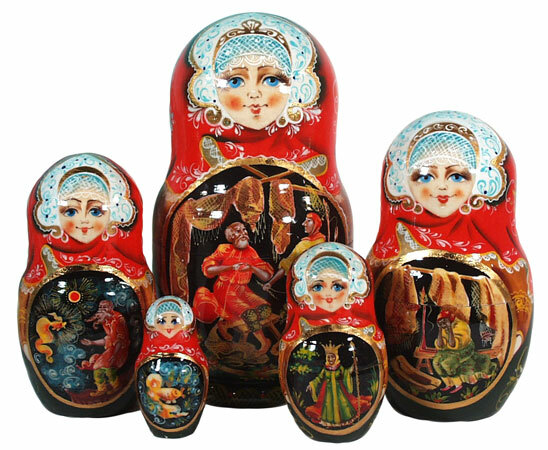 There are 5 dolls with the fragments from this story. This moralistic folktale was reworked by Pushkin as a poem. Once upon the time lived a poor fisherman. One day he caught a golden fish. The fish talked with him in a human voice and begged him to go free. She promised to fulfill any of his wishes. He was a kind man and simply let her go free. After hearing the story, the fisherman's wife shouted at him and sent him back to see the magic fish - she needed a new trough. The fish granted the wish, and a new trough magically appeared at their hut. But his wife continued to scream and yell at him. She wanted a new house, then she wanted to be a noble lady, then wanted to be the Queen of the Land. Every time she sent her old husband to the shore, the golden fish fulfilled the wishes of the wicked wife. The woman now wanted to be Empress of the Land and the Sea, and that the golden fish be her servant. The fisherman went to the shore, called the fish and when she came he explained the last wish of his wife. The gold fish disappeared without a word. The old man then went home and found his old mud hut, his poor wife, and a broken trough. The tallest one is 6", the smallest - 2".